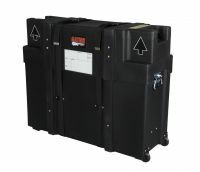 Flat Screen Monitor cases for Trade Shows etc. Various types utilized by my customers. Please select carefully as all are different in construction and delivery time, and all Sales are Final. Their are many sizes and styles available, only some sizes shown on website. Additional shipping charges may be incurred on some larger cases. Call us @ 315-292-0288 for help or Email Us. This case is Build To Order(2 weeks) but may be in-stock. 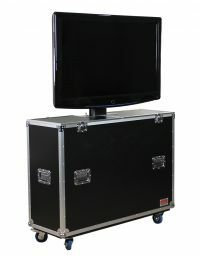 ATA Wood Flight Case w/ Hydraulic LCD Lift & Casters; Fits LCD & Plasma Screens Up to 65"
Build to order - ships by truck. LCD/Plasma Case Fits 48-52" Screens; Black; Max Width 52". 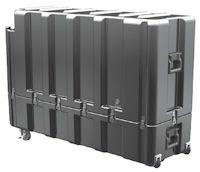 Duel LED Case Fits two 37-47" Screens; Black; fits screens with depth up to 2.25"
This case comes filled with foam and a boxcutter to cut the foam to fit your contents. Ships from California, 5-7 days to East Coast. 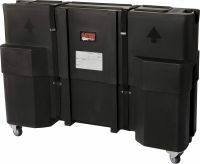 Take off lid - These rugged-duty containers are constructed of high density polyethylene to provide a safe, economical way to ship valuable electronic devices, personal computers and peripherals, cameras, video equipment and other sensitive equipment.